Baby Jogging helps the child to take its first steps safely. Thanks to the ergonomic adjustment system, the toy offers 6 different positions to adapt to children’s different physiques, always allowing a natural and correct posture. 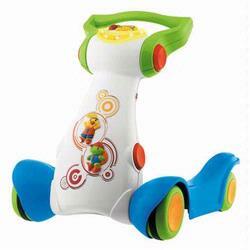 Every step taken by the child is accompanied by flashing lights and fun melodies. Depending on the speed of walking, the lights come on progressively and the rhythm of the melody speeds up or slows down. 2 x AA 1.5V batteries (not included). Award-Winning Toy!